Other Fabrics There are 4 products. A lightweight, nylon fabric that is woven with coarse, strong warp and filling yarns spaced at intervals so that tears will not spread. It is produced in a range of weights and textures, waterproof, water resistant, fire resistant, zero porosity (will not allow air or water through), lightweight, mediumweight and heavyweight. Textures range from soft and silk-like to crisp or stiff that sounds like a paper bag when they are moved. Rip-stop nylon is often used in yachts for sails and spinnakers, hot air balloons, kites, parachutes, camping equipment, such as lightweight tents and sleeping bags, flags, banners and many other applications which require a strong lightweight fabric. Rip-stop reinforcement can also be incorporated into heavier fabrics which require extreme durability, such as those used in the manufacture of luggage and Nomex-protective clothing for riot police. Ripstop fabrics are used in yacht sails and spinnakers, hot air balloons, kites, parachutes, remote control hovercrafts, camping equipment such as lightweight tents and sleeping bags, swags, flags, banners, and other applications requiring a strong lightweight fabric. Ripstop reinforcement are incorporated into heavier fabrics requiring extreme durability, such as those used in Battle Dress Uniforms, Nomex protective clothing for firefighters and other workwear, Brazilian Jiu Jitsu uniforms, outdoor and sports clothing, backpacks, and luggage bags. 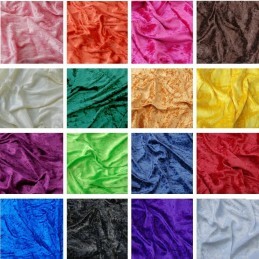 Luxurious and silky soft Dimple fabric. It has a soft short pile that is as soft as cashmere. It is the ultimate fabric for making baby blankets, cozy baby robes, apparel, toys, quilt backings and just about any baby accessory. Dimple Fleece comes in many different variations and textures: dots, stripes, lines, novelty prints, embossed and it also comes in just about every colour under the rainbow. A somewhat elastic, machine-knit dress fabric. Most commonly made of wool or cotton, but can also be made from rayon or synthetic fibers. Artificial leather is a fabric or finish intended to substitute for leather in fields such as upholstery, clothing, and fabrics, and other uses where a leather-like finish is required but the actual material is cost-prohibitive, unsuitable, or unusable for ethical reasons. 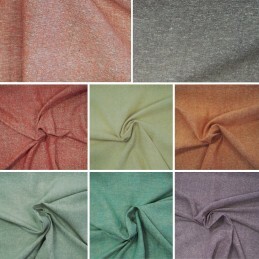 Viscose is commonly used as dress fabric as it hangs beautifully and has a soft feel to it. We have a range of prints and designs to suit your needs. Mesh is similar to web or net in that it has many attached or woven strands. Lace is an openwork fabric, patterned with open holes in the work, made by machine or by hand. The holes can be formed via removal of threads or cloth from a previously woven fabric, but more often open spaces are created as part of the lace fabric. Lace-making is an ancient craft. True lace was not made until the late 15th and early 16th centuries. A true lace is created when a thread is looped, twisted or braided to other threads independently from a backing fabric. Originally linen, silk, gold, or silver threads were used. Now lace is often made with cotton thread, although linen and silk threads are still available. Manufactured lace may be made of synthetic fiber. A few modern artists make lace with a fine copper or silver wire instead of thread. 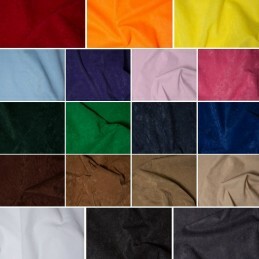 This is our range of fabrics that are good for dressmaking, check them out!